For 10 years, chef Matthias Merges has worked with a major prison to operate an inmate-run vegetable garden that supplies produce to local homeless shelters, nonprofits and fine-dining restaurants in the Chicago area. It's no secret that America's prisons are overcrowded: In 2011, one in 107 adults was behind bars, and many of those prisoners were incarcerated for nonviolent offenses. Both sides of the political aisle agree that this is bad news, and many concerned citizens, including one Chicago chef, are trying to change the system. For 10 years, chef Matthias Merges (of Yusho, Billy Sunday and newly Michelin-recognized A10) has worked with the Cook County Jail to operate an inmate-run vegetable garden that supplies produce to local homeless shelters, nonprofits and fine-dining restaurants in the Chicago area. 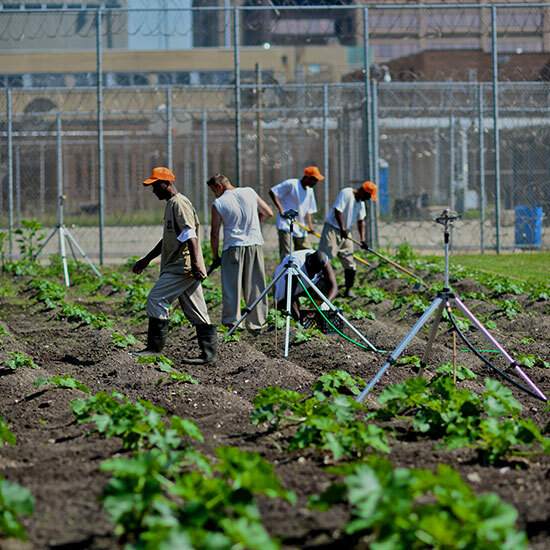 The garden is part of the Cook County Sheriff's Pre-Release Center, a larger program that has helped more than 5,000 inmates deal with substance-abuse problems and get on a path to a productive life after prison. Merges learned about it more than a decade ago, when a man named Mike Taff (the garden's coordinator) showed up at the kitchen door of one of his restaurants, his arms filled with produce grown by inmates. At first, Merges agreed to use the produce for the staff's family meal. After seeing the great quality and realizing the garden's potential, he started working with the Pre-Release Center to grow produce specifically for Chicago's fine-dining restaurants. "It's a way for us to give back to the community," says Merges, who has since hired graduates of the program. In addition to learning valuable skills that they can use upon their release, inmates can earn their Master Gardener certificate, and Merges and his employees work with the inmates by using cookbooks and techniques to show what it's like to work in a restaurant. The garden recently added a greenhouse and has been experimenting with aquaculture. At last count, they generated more than nine thousand pounds of produce each year.